A fresh and easy meal to enjoy while doing the Daniel Plan (not fast). Thank you Butcher Box for making this meal possible. All views expressed are our own. Last week my husband and I decided we were going to be committing to the Daniel Plan this year. We have heard of the Daniel Plan Detox in the past, but that was too strict for us. With the Daniel Plan we can totally adhere to the guidelines thanks to companies like ButcherBox. ButcherBox is quite possibly the MOST Helpful company when it comes to the Daniel Plan. They offer grass fed beef, organic pastured chicken, and Heritage Breed Pork. Their boxes are delivered on your watch and it is less than $6.50 a meal. 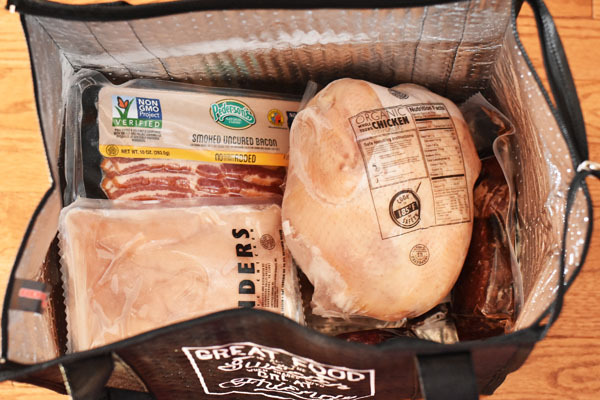 Each monthly box is curated to contain only the best meat selections. This is super helpful to someone like myself who wants to eat healthy proteins but does not have easy access to them in-store. Each monthly delivery flash frozen, and packaged to be eco-friendly. You can also cancel anytime which is awesome! 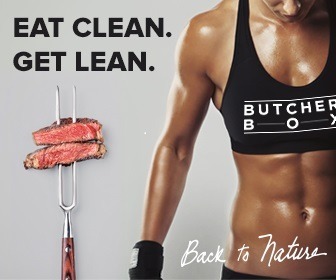 You really have NOTHING to lose with ButcherBox. Each box contains 7-10lbs of organic, grass fed meat which can make 15-20 meal portions. Perfect for meal prep people like myself! 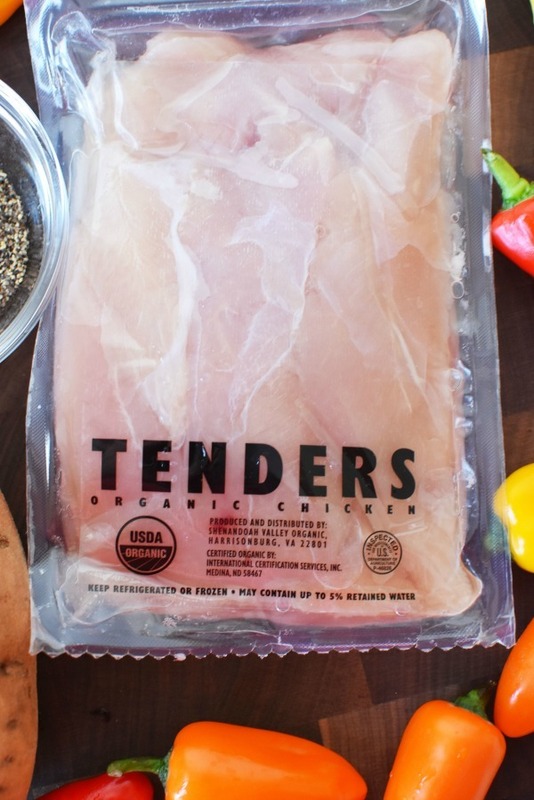 Since chicken tenders are the easiest form of chicken to meal prep with, I decided to use this protein first. 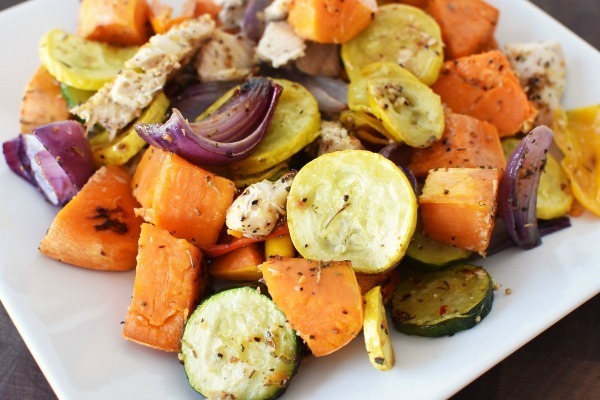 Paired with some veggies like sweet potato, red onion, sweet peppers, squash, zucchini, and you have a tasty meal! The best part? 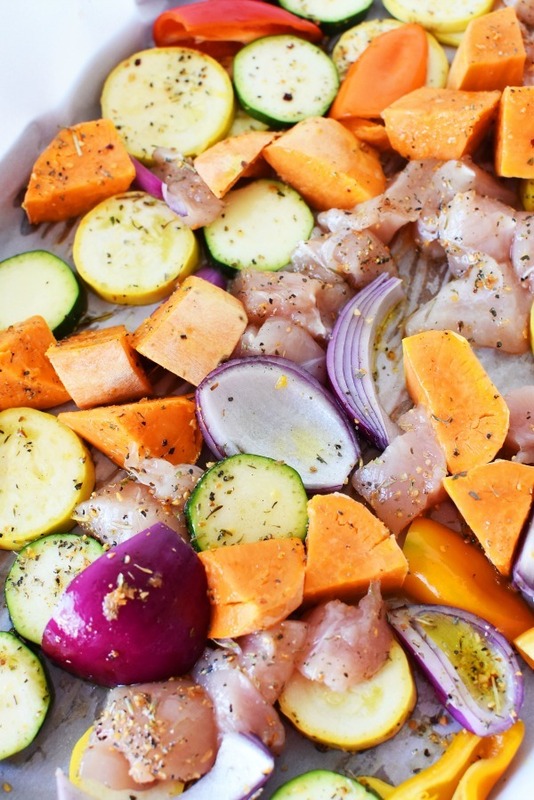 This Daniel Plan Sheet Pan Chicken & Vegetables is easy to make, and requires just one pan. I even used parchment paper to make things so simple! Since I wanted to make 6 total meals (paired with brown rice) I made two sheets pans worth of chicken. 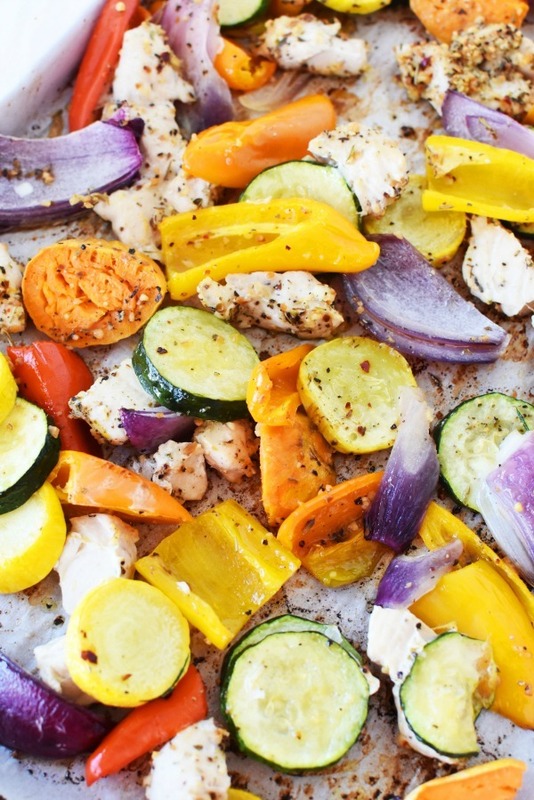 An easy to make chicken and vegetable dish that uses one large sheet pan or two smaller ones. This is also a Daniel Plan approved meal. 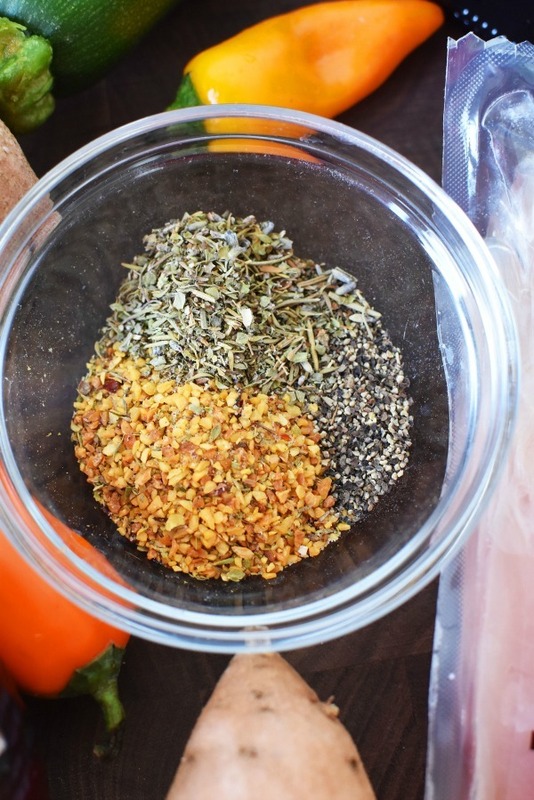 1 tablespoon all seasoning * a blend of onion powder, garlic powder, herbs, pepper, and salt. Peel, and prick your sweet potatoes with a fork. Pre-cook them in a microwave for 8 mins to soften them. Once they are done, slice them into chunks and lay them on your parchment lined sheet pans. *see above for sheet pan sizes. Toss to coat and bake for 10 minutes on each side. A total cooking time of 20 mins will produce tasty veggies that are not overly mushy and some moist chicken. I stretched this by adding 1 cup of cooked whole grain brown rice to each meal portion. Want to try ButcherBox? We have a special deal for our readers! Right now you can save $10 on your first box and get FREE Bacon!!! What do you have to lose? Saving money and FREE meat are two things I can get behind! Oh interesting. I have never heard of this plan, but I am definitely interested in learning more about it. That sounds like a great meal. I like how the meat comes flash frozen. I love anything I can do on a sheet pan. Until a couple weeks ago I never even heard of this and since then I can’t get enough of cooking that way. I will definitely be doing this one. That looks really good. Thanks for sharing this great recipe. It looks really healthy, and I know it’s a lot more affordable than buying the plan meals. Oh wow, they really do keep it natural with their meats. 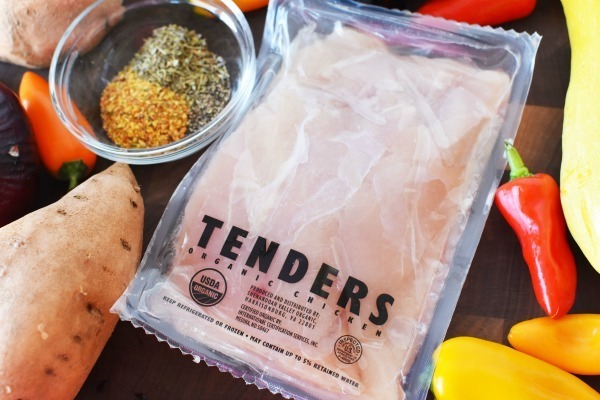 The Butcher Box sounds awesome and I think your chicken dish looks amazing. Everything you made looks so healthy and delicious. Your sheet pan vegetables, especially, look so appetizing and easy to make. Getting quality meat delivered to my door would be great. I haven’t heard of the Daniel Plan though. I love sheet pan meals and this looks delicious. 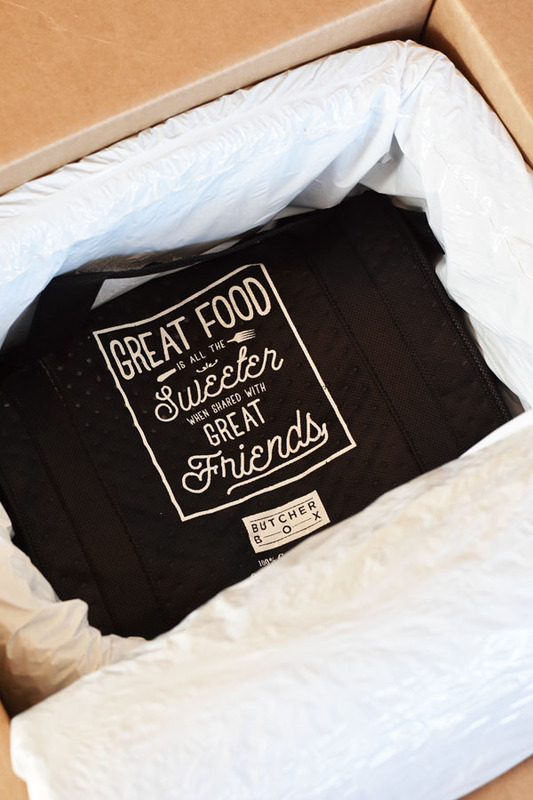 The Butcher Box is such a great service. This looks so delicious and easy to make. 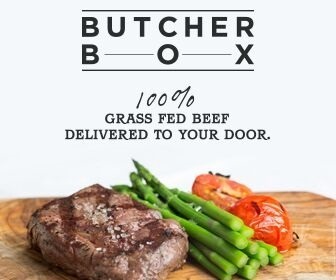 I would love to give ButcherBox a try. I have been looking for a better quality meat for my family. My friend and I were just talking about trying ButcherBox. I will have to add this recipe to my meal plan for next week. I like everything in this post. I love the Butcher Box, I love the recipe, I love it all! I am ready to try all of it. This is awesome! I love easy preparation meals! Will have to check this out! This meal looks super delicious! I will have to check it out! That looks amazing!!! I need to check out this brand, I love boxes like this!! The cost per meal is too good to be true and every family can appreciate that. 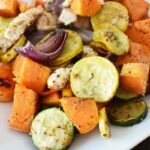 Those veggies look so perfectly cooked I am anxious to try this recipe. We’re working at eating cleaner and recipies like this mean you don’t have to give up flavor to do it.